Activists ‘released cockroaches and locusts’ at two London branches of a UK restaurant-chain after the company was involved in a UK Border Agency immigration sting against its own staff. Byron Hamburgers, which has over 60 branches across the UK, is facing a growing backlash after it ‘entrapped’ its own staff by calling them to a fake meeting which was in fact part of an operation to detain and deport illegal migrant workers. 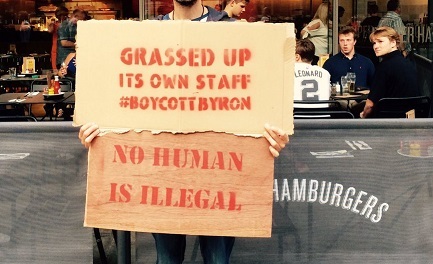 Activists, who have since started a campaign against the company, using the hashtag #boycottbyron, said that they released “many thousands” of the insects into two of the burger-chain’s London branches on Friday evening in response to Byron’s “dehumanised” behaviour, Mail Online reported. A London branch was also forced to close on Sunday night after hundreds of protestors gathered outside. The raids, which took place across London on 4 July, saw immigration officers round up 35 people from Albania, Brazil, Egypt and Nepal, the Home Office has confirmed. Byron employees were allegedly told to attend a health and safety meeting at 9.30am, according to a report from The Guardian. In a statement published on its website, Byron said that it was unaware that any of its workers were in possession of counterfeit documentation until the Home Office brought it to its attention. Companies that employ illegal workers can be fined a maximum penalty of £20,000 per employee, which meant that Byron was facing a fine of up to £700,000 - but it evaded the penalty by colluding in the sting, Mail Online reported. The company said in its statement: “The Home Office recognises that Byron as an employer has always been fully compliant with immigration and asylum law in its employment practices.